The GPS manager’s goal is to hand off accurate models to on-site superintendents and foremen so they can best manage jobs. Ballou is confident because of his 15 years of experience installing and working with GPS systems and machine control as tools for DXI’s job-site and project-management efforts. He is solely responsible for the company’s ongoing GPS journey, and he’s also taking the company forward with a drone program. He’s the conductor and the band, all in one. DXI is a site preparation and utility contractor with 50 years in business and more than 300 employees working in four states: Maryland, Virginia, Delaware, and Pennsylvania. The company was an early adopter of GPS technology, starting just after the turn of the century. Now, with Ballou at the GPS helm, DXI’s data-enabled fleet includes two excavators, a grader, and 14 Caterpillar D6 crawler dozers equipped with GPS and machine control. Ballou uses a variety of technology, including Topcon’s Sitelink3D, to ensure his superintendents and operators have real-time data control and access to machine tracking and reporting. Machine control works with the system to make sure projects stay in place and on grade. 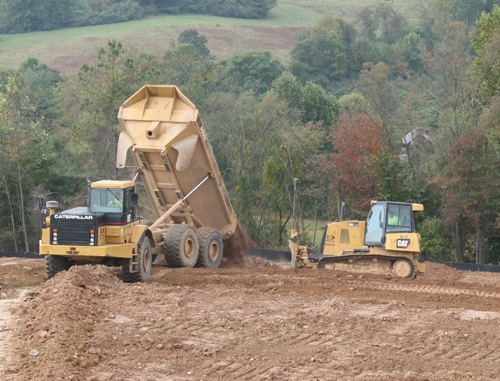 DXI relies on GPS to move thousands of yards of dirt per project. He says his utility crews take advantage of the technology as well, running GR-5 rovers where they are laying out jobs and checking work. “It’s expected that we have GPS and machine control on every job, so every job we have, we model,” Ballou says. “It doesn’t matter how big or small it is. We know that just having site control, being able to do all our pre-existing and as-built topos that we start with, that’s priority No. 1. DXI has found a myriad of benefits with GPS, and some of them are beyond tracking positioning and reporting or adjusting production. And it has saved time, both in preventing unnecessary passes on landfill sites, and for Ballou personally, in that he doesn’t need to drive to as many projects. At one time, when changes were made to a job design, there was no other choice but to load the new data into a jump drive, take a pickup to the site, and manually download the data. What Ballou does spend a great deal of time on is researching the latest in GPS and machine-control technology, and he has an idea where his next frontier will be. “Obviously, [the industry is] going away from masts,” Ballou says. “Topcon’s got 3D-MC Max that’s mastless. I demo’d it, but the bugs weren’t out of it. They say they have them out now, so going into 2019 that will probably be my next investment. “I fly topos now with a drone,” Ballou says. “I have my UAV license and I partner with Identified Technologies. I’ve probably got 130 to 140 flights in over the last year.” He uses a Topcon system with the drone. Ballou says that, in general, the accuracy is there, but the problem is in the details—as in too much detail. “It will pick up a fire hydrant, or a silt fence, every detail,” he says. “If I fly near a tree line, it can pick some of that up.” When non-dirt details are picked up, they can affect the contours, showing them as going up and down when in reality, there’s just a tall object present. As a result, it’s been difficult to convince his estimators of the accuracy. Ballou must go back to his modeling company, sometimes more than once, incurring time cleaning the data for takeoff and modeling purposes. He pays a subscription to his vendor for the drone; DXI does not own it. “In my research, it didn’t seem to be value-added to own the drone,” Ballou says. “You would have to maintain it and handle all the updates. And with a monthly subscription, they clean all my data and post it to their websites. I get an email telling me it’s ready. Every flight after the first one is in there, and production can go in with a password; anyone can have access to that. “It’s a work in progress. The initial topo is the only glitch I have right now,” Ballou says. “DXI knows how value-added all this technology is. I’m biased, but it makes my job unique. I just know that my accuracy is there, my modeling is there. And it’s been amazing the time saved not having to drive [to some job sites] because you can watch and report on jobs remotely. We’ve been able to maintain and increase efficiency. “It’s not about hiring more people to do what I do, it’s about accuracy and getting it into the hands of the superintendents and foremen, the guys who are on the job every day,” Ballou says.